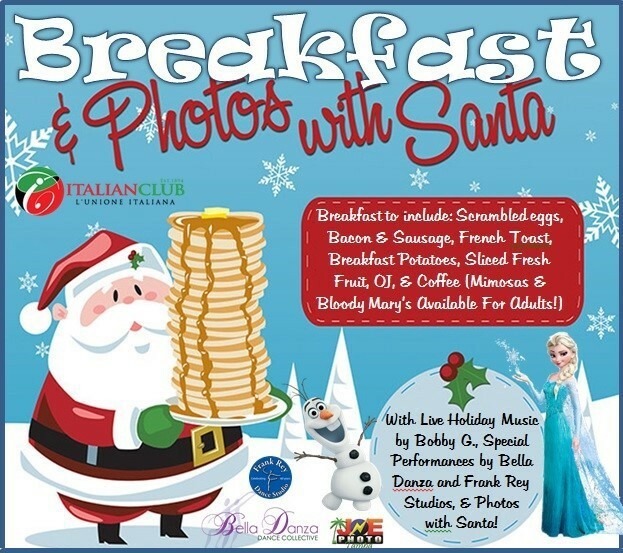 Join us on Sunday, December 4th as we host the Annual Breakfast With Santa at the Italian Club from 11:00am-1:00pm. This year’s event is brand new, and just wait until you see what we have planned! Our delicious menu will include Scrambled Eggs, Bacon & Sausage, French Toast, Breakfast Potatoes, Sliced Fresh Fruit, OJ, & Coffee! Mimosas & Bloody Mary’s will also be available for purchase (adults only!) Something new for this year will be live Holiday music by Bobby G., special performances by Bella Danza and Frank Rey Studios, a very special performance by Elsa and Olaf, and last but certainly not least – Photos with Santa! Memento photos this year will be provided by Joe Photo Tampa – and will be delivered via email this year. This is going to be a wonderful event to kick off the holiday season, so make sure to get your tickets early! This event is open to club members and the general public, so feel free to invite friends and family. Tickets can be obtained by calling the Italian Club Main Office at (813) 248-3316. Tickets must be purchased no later than December 1st, so that we can get an accurate head count! This year the Club is working with the Marine Corps Toys For Tots Program to help make sure every child has a toy to open on Christmas. To do our part, we are asking all those who attend to please bring a new, unwrapped gift or gifts to this event so that we can help those in need. The more toys we can collect, the more families we can help.